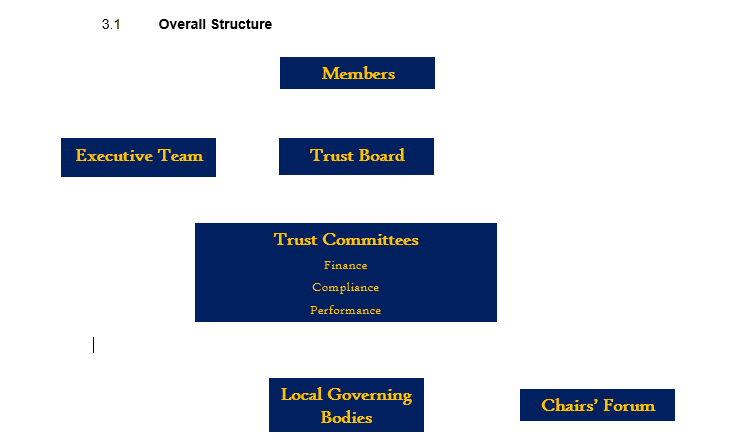 The document below explains the role, responsibilities and job description of a member of the Local Governing Body. The chart below explains how Governance works within the Preston Hedge’s Academy Trust. Our Governing Body regularly visits school to provide support and challenge to our Leadership Team, to review school priorities and speak to our children and staff. In November our Governors focused on our current priorities on a visit to school and also conducted a learning walk around school. During the walk they reflected on the attitudes and behaviours of our children and spoke to children in every class about Marking and Feedback. They were looking to ensure our policy was embedded and that our children are able to explain how it works. Our Governors came into school to review our priorities for 2018-19. The conducted a learning walk across school to see how our children and staff had settled back into school. There was a particular focus on how leaders working in new roles had adapted to their roles and what their priorities were in 2018-19. Governors conducted a learning walk in school and reviewed our emerging end of year data as well as analysing our progress against school priorities. Particular attention was paid to the progress made against our SPAG priorities. There was then a discussion with the Headteacher and SLT members about emerging priorities for 18-19. The Chair of Governors set up a visit which was attended by five Governors and the Headteacher and Chair of Governors of Parklands Primary School, to review our progress against our Ofsted priority around marking and feedback. Governors spent a session with the Maths and English leads to identify our policy expectations and then conducted a learning walk in every year group. Pleasingly the Governors found a consistent approach to marking and feedback throughout school. Governors all spoke to children in each year group to check they understood the policy and processes and to get their feedback about this effectiveness. A Governor also challenged school leaders to make the policy more transparent to Parents’ by flagging it overtly at Parents’ Evening which was the following week. This was immediately implemented. Governors visited school in February to complete a learning walk focusing on the afternoon curriculum, our priority around Early Years and our Values systems. Governors went into each classroom to look at afternoon provision and the engagement of children. They then scrutinised the effectiveness of actions taken to improve Year R, linked to our priority. Finally they reviewed the Values system with Mrs Coles, once again linked to our improvement priorities. Governors who attended completed monitoring forms and these will be scrutinised at the FGB in March. I have been a Governor for 7 years, and whilst my two boys have long since left, I still feel I have a strong link to the school. Having been a member then Chair of the Friends of Preston Hedges, I move across to the Governing body and have been chair since 2013. My time as a governor has seen much change at the school, we became an Academy, and are now looking at other ways to make our school stronger and more successful. These are really exciting times, and I love the challenge of dealing with a changing educational environment, whilst helping to maintain a great learning environment for our fabulous pupils. My background is in Construction/Civil Engineering, and I have specialised in building efficiency, and quality management. This has been of use at school, particularly as much of my experience has been related to school design and construction. I sit on the Standards Committee; this reflects my interest in the range of subjects that the children learn and aligns well with my professional background which is in purchasing. I worked for many years in the automotive industry and am now self employed and working in the construction industry. My experience includes managing suppliers, contracts, budgets and costs and I also have experience in project management and accounts. In my spare time, I enjoy watching my two boys play football and also enjoy music, keeping fit and spending time with family and friends. I enjoy being a governor and try and get into school as much as I can. I try to support staff and parents in providing the best opportunities for all children at the school and their making school life enjoyable and challenging. I have two sons, 1 in year 1 and one in his last year if preschool. I have lived in the area since I was very young, and Wootton specifically since 2006. I became a member of the governing body in 2016 as I wanted to contribute to the school and do my bit for its success. I work as Head of Consulting for a global IT company where, on top of the IT, I manage forecasts, budgets, management board reports, recruitment, and performance management. I have also spent a great deal of time developing my team and helping them achieve their career goals. This experience has aligned well with the finance and HR committee where I am now a member. Outside of work I also coach at a Junior Badminton club, so I have experience of working with young people and safeguarding. I have lived in Wootton for over ten years and volunteered as a Governor three years ago in order to take a more active role, giving something back to support the ongoing success of the school. I have two daughters at the school who both experienced a very positive start to their school-lives and I wanted to help ensure that others enjoy a similar experience. I qualified as a chartered accountant early in my career, however have had a variety of roles and experiences since, including defining and implementing business strategy, and providing financial and operational consultancy for smaller business partners. In my role as Governor I aim to share these skills with the Governing Body and School Leadership Team for the benefit of the school, the pupils, parents and staff. I currently chair the FHSR (Finance, Health & Safety & Resources) committee. Coming from a family that is keen on education I have always been interested in learning and picking up various life skills, whether that is in a classroom environment or through practical experience. This is something that I already see in my daughter who is now in Year One at Preston Hedges, and I am looking forward to the opportunity of giving back and supporting all the students at PH (including its sister schools) to be fully equipped in becoming the best they can be in life. I work as a Specialist Lawyer for a large financial institution and with each deal that I’m involved with I’m driven by the desire to ensure there is a commercial benefit whilst also managing the legal risk. Easier said than done sometimes! I joined Preston Hedges as a Parent Governor in February 2011. I am a parent of two boys, Blake in Year 2 and Travis in Year 5. I enjoy life drawing, textiles, visiting historic buildings and spending time outdoors with my family, especially supporting the boys with their local football teams. My background is in education and I have been a Leading Teacher of Art, Design and Technology at a school in Milton Keynes for the last fifteen years. I am very passionate about education and how the creative arts and problem solving is a vital part of the development of a child. I have been the Chair of the Safeguarding, Behaviour and Wellbeing Committee for the last three years. As part of my role I have the privilege to spend time in school talking to the children and staff to improve my knowledge as a governor. I thoroughly enjoyed working with all of Year 1 last year on their Diwali day and holding the community photography competition in the summer, which was fantastic! I’m proud to be able to say I’m a parent of a child who goes to Preston Hedges and am very keen to see the school continue to thrive and develop. I am an enthusiastic, well-motivated individual who would support and challenge constructively to help the school wherever possible. I have a daughter in year 3 and a son who we hope will be starting in 2018, therefore I will be in a position to be willing and able to invest my time and commitment over a long period. I am an experienced financial consultant working for the UK’s largest Mutual insurer, in which everything we do is built on the foundations of Independent Governance and client outcomes (in this case the children, teachers and school). My day to day role includes managing client relationships, presentations to employers and consultancy on pension and investment options. I believe I have gained valuable experience and knowledge as a result of sitting on corporate employee representative committees as well as using management, mentoring and situational leadership skills as part of my everyday work. I feel these skills and attributes would be both useful and beneficial to the role of parent governor for the school. In my spare time I enjoy keeping fit, taking part in triathlons and am happy to encourage my children and others to lead a happy and active lifestyle. This is my first year as a Community Governor at Preston Hedges and I’m sitting on the Standards Committee. I have 2 children at the school, and seeing the fantastic start they have made at the school to their education and learning, I’m keen to contribute to the continued success of the school for all children and ensure that we provide opportunities and maximise potential for all, including the teaching team. As a Technology and Change Director at a Global Bank, I lead and manage teams through significant change whilst implementing strategies to improve and maintain quality whilst balancing costs and risk. I believe these skills will help me contribute to the governing board, school and children.